After a time enjoying old-world wines, the author returns home to the Piedmont for tasting. Since my twenties, I’ve been slightly obsessed with fine wine. I had my first encounter back then working as a waiter at a Four Seasons hotel. Thus began the love affair. My obsession went into overdrive after completing a sommelier basics class at the Capital Wine School; I studied, took exams, and was certified as a specialist of wine and a sommelier. Fast-forward to the present: I own a sheep farm, work for the railroad, and assist the wine team at a five-star restaurant. 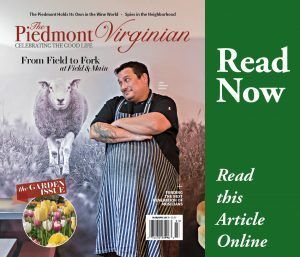 When asked by my friends at The Piedmont Virginian if I could contribute an article, I replied, “I’d be happy to.” Surely I could find a few available hours somewhere, couldn’t I? Last August, I attended the annual Society of Wine Educators conference in Washington, D.C. One of the seminars was led by Jay Youmans. In addition to having a lengthy list of post-nominals, Jay is a Master of Wine—an accreditation akin to holding a doctorate in the field of wine. Jay operates the Capital Wine School and has been an important presence on the Virginia wine scene for more than a decade. For the last three years, I had studied, tasted, and drunk (not necessarily in that order) almost exclusively old-world wines, so I was looking forward to this refresher on the wines in my own backyard. My experience from years past was that there were a handful of producers with well-made, delicious wines and scores of producers with wines of lesser quality. 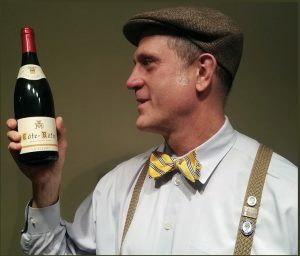 After reviewing Virginia wine history, geography, and geology, we tasted 10 wines ranging from what I would call “very good” o “excellent.” Two things impressed me most. First, they all were solid examples of well-made wines, bypassing that “good, for Virginia” dismissive qualifier. Second, I had never heard of half the producers. My takeaway from this seminar was clear. It was time to explore the oft-overlooked viticulture of the region that I call home. Having a sheep farm and working two other jobs means that such projects take time. Often they require a catalyst. That catalyst came in November. I t was then that I met Jonathan Weber at a wine dinner at Field & Main Restaurant in Marshall (See page 16). That amazing event was hosted by restaurateur Neal Wavra and Gaston Hochar of famed Chateau Musar in Lebanon. Each dinner attendee exuded enthusiasm and delight. Jonathan is the winemaker at Linden Vineyards and works for Jim Law, a Virginia wine pioneer and mentor. 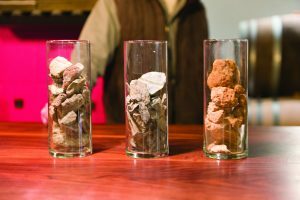 What better place to begin re-exploring (and re-evaluating) Virginia wine than Linden? Jonathan informed me that in December, Linden would be having modified tastings featuring some of their special cellared library wines! How’s that for serendipity?